The European Parliament have voted to support Green Party measures which will improve the design of lorries to make them safer for cyclists. The new legislation, on the dimensions of trucks in Europe, will force manufactures to improve windows and mirrors to heighten cyclists’ visibility – which in turn could save hundreds of lives in London and across Europe. 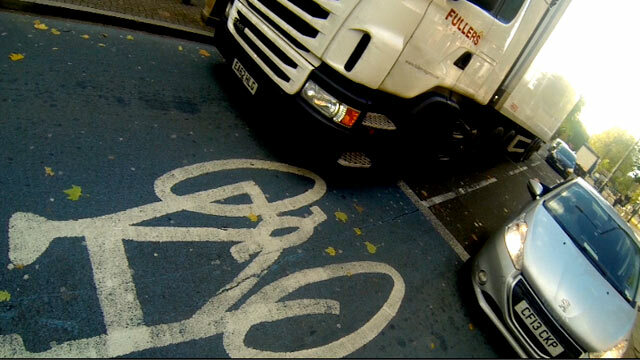 In 2013 nine of 16 fatalities on London’s roads involved lorries. MEPs also voted to improve the efficiency of trucks and lorries, and vitally, voted to hold back measures which could pave the way for 25-meter long ‘mega-trucks’ to hit European roads. Green Party MEP, Jean Lambert, said: “MEPs have voted today to introduce EU measures which will make cyclists more visible to lorry drivers. These improvements will reduce the number of accidents which sadly occur on our roads. “In the UK alone, thousands of cyclists are seriously injured on our roads each year. I’m therefore delighted that measures which will improve visibility for lorry drivers have been supported. As a Green MEP, I believe we must do all we can to make our streets safer and cleaner, and this can begin by making roads safer for cyclists. The new regulations are expected to come into force in 2016. This entry was posted in International News, National News and tagged cyclist safety, MEP, no mega trucks, safer cycling, Transport by tamesidegreens. Bookmark the permalink.